Dr Albert Neville Thiele was a world-recognised leader in the field of electrical Engineering and particularly for his pioneering work on loudspeaker and filter design. A prodigiously productive thinker and publisher, Neville always had a few new ideas under consideration, and at various stages of preparation towards release. This paper is “Copyright 2015 the estate of Albert Neville Thiele”. Permission granted for Audio Engineering Society Melbourne Section to publish. Contact AES Melbourne or Graeme Huon for further information. 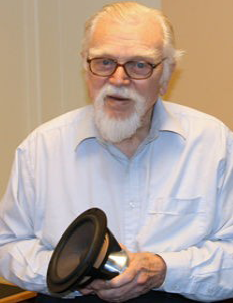 Whilst famous for his work on taking the mystery out of loudspeaker design, Neville was well trained in general electronics, particularly with his interest in audio design and especially in the mathematics of general filter design. In fact it was this skill specifically that led him to the breakthrough work on loudspeaker parameters. It should be remembered that Neville pioneered the introduction of television in this country with his work with EMI in England and Australia, first for the introduction of black and white television in 1956 and again for the introduction of colour television in 1975, being responsible for the design of the first television receivers – a skill base far broader than just loudspeakers. His work with Whise Precision Audio implemented the transfer functions for his NTM (Neville Thiele Method) crossovers in passive and active analogue and digital form – a family of the most unusual but very useful transfer function pairs that incredibly sum to exactly 1, as required. In this video recorded in the late nineties Neville discusses the development of the Thiele Small lumped parameters, going on to discuss Graeme Huon and Greg Cambrell’s work on distributed parameter Parametric Acoustic Modelling (PAM) which built on his own work, culminating in the commercialising of the PAM concepts in the highly regarded Whise Profunder range of loudspeakers. Graeme and Greg also feature in this video describing the development of PAM. After a long and fruitful life, Neville died in October 2012. His achievements are outlined in this obituary. Neville wrote about his early days in Brisbane, his brother Len (actor Leonard Teale), and other early influences on his life and career for the Australian Sound Recordings Association (http://asra.asn.au/) in 2007, in an essay entitled The Making of a Broadcast Engineer.